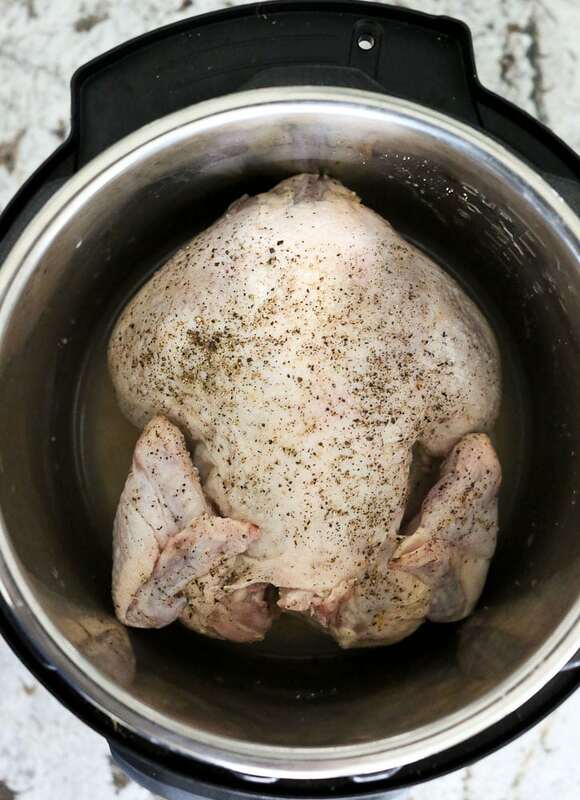 Do you know how to cook a whole chicken in the Instant Pot? This post will show you how–it’s perfect for meal prep or a family dinner! Please note that links to products may be affiliate links. I appreciate your support! 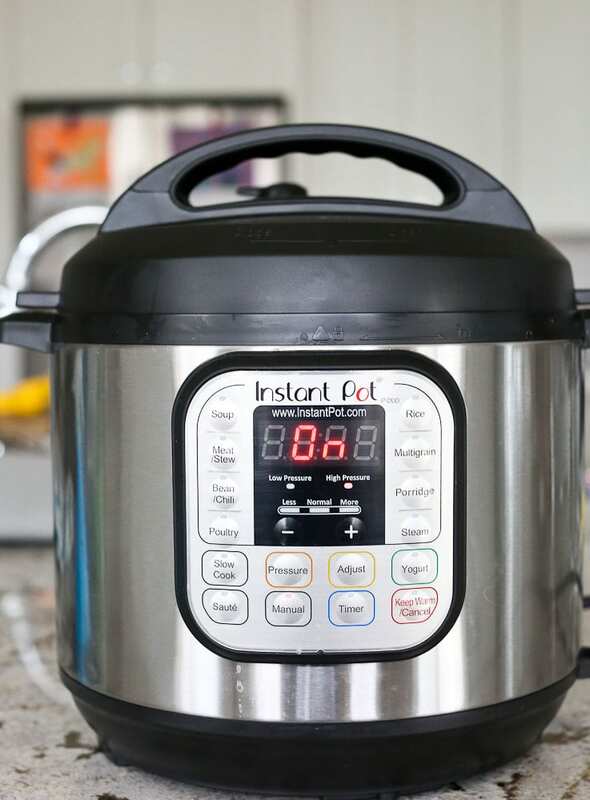 I’m using my Instant Pot more and more, and I’m finding it to be a real time saver in a lot of ways. 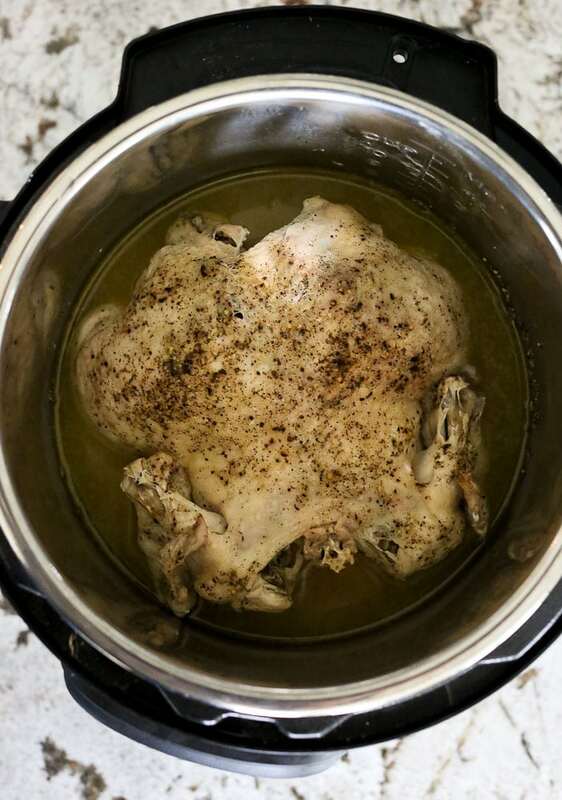 My favorite way to save time with the Instant Pot is to use it to cook a whole chicken! 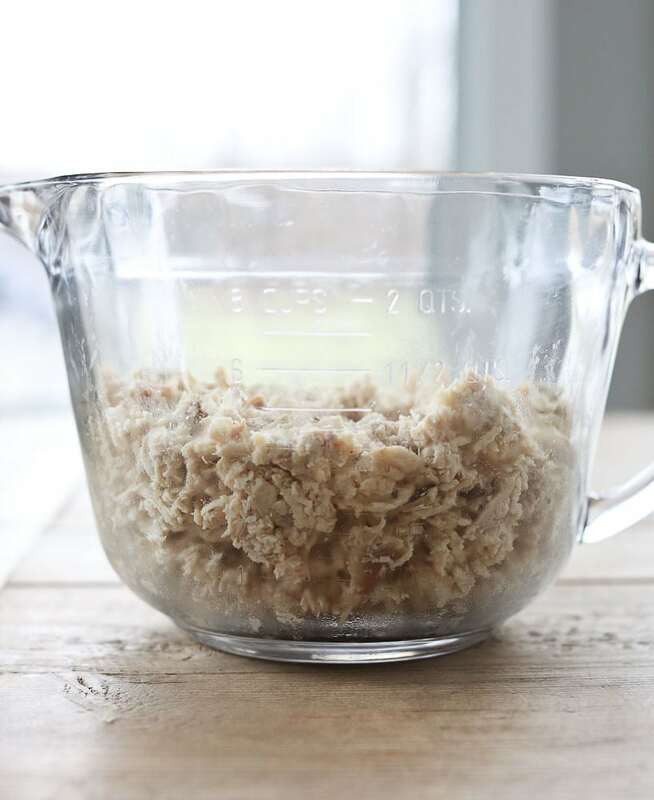 Add 1/2-3/4 cup water to your Instant Pot. Squeeze the juice of half a lemon on the chicken and sprinkle liberally with salt and pepper. Stuff the other half of the lemon inside the bird. Place the chicken in the pot breast side down and put the top on the Instant Pot. Make sure the vent is in the sealed position, and then press the manual button and set the Instant Pot to high pressure for 7 minutes per pound. (I have a cheat sheet with a list of cooking times for your Instant Pot. Want me to send it to you? Click here to get your Instant Pot Cooking Times Cheat Sheet! Once the Instant Pot comes to pressure and then cooks for the amount of time right for the size of chicken you are cooking, allow the pressure to release naturally, about 15-20 minutes. Do not use the quick release method as this will make your chicken dry. Remove chicken and serve or prepare for meal prep. Notice that I don’t add a lot of seasoning nor do I brown the skin. You can do both of these things if you are serving this Instant Pot whole chicken for dinner. Use the sauté feature on your Instant Pot to brown the skin, and then use the rack it comes with to keep it out of the liquid. Then use whatever seasoning you normally use on roasted chicken and proceed with the rest of the recipe as written. Either way, you’re going to end up with a juicy, moist cooked chicken. The reason I don’t brown the skin or season it beyond salt and pepper is that when I use my Instant Pot to cook a whole chicken, I am doing it for meal prep. Want to know what else the Instant Pot has been fabulous for? Making homemade bone broth! I used to always make slow cooker bone broth. I love that it’s a hands off method, but it takes a really long time and I actually don’t like waking up to my house smelling like chicken stock. It’s just not a morning smell. 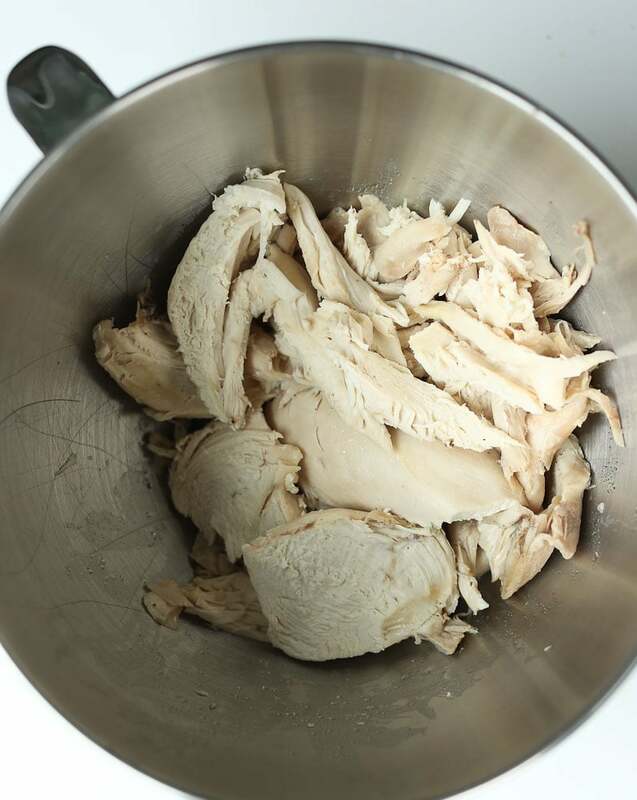 I most often take my meat from the Instant Pot whole chicken and shred it in my Kitchen Aid mixer. 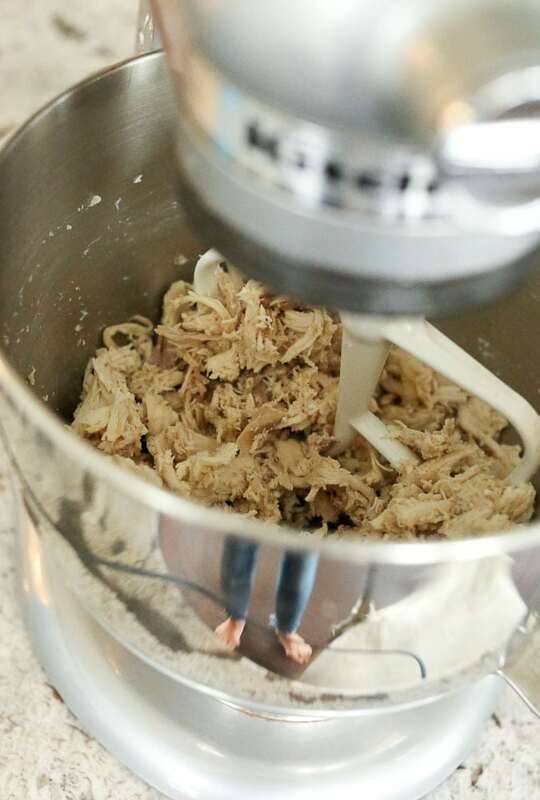 Do you shred chicken in your stand mixer? It’s another big time saver! I end up with about 4 cups of shredded chicken from a 3 pound chicken. So many quick and healthy meals can be made when you have cooked chicken on hand. Here are some of my favorites! I am convinced that learning how to cook a whole chicken in the Instant Pot can change your life. Here’s the printable recipe for you! 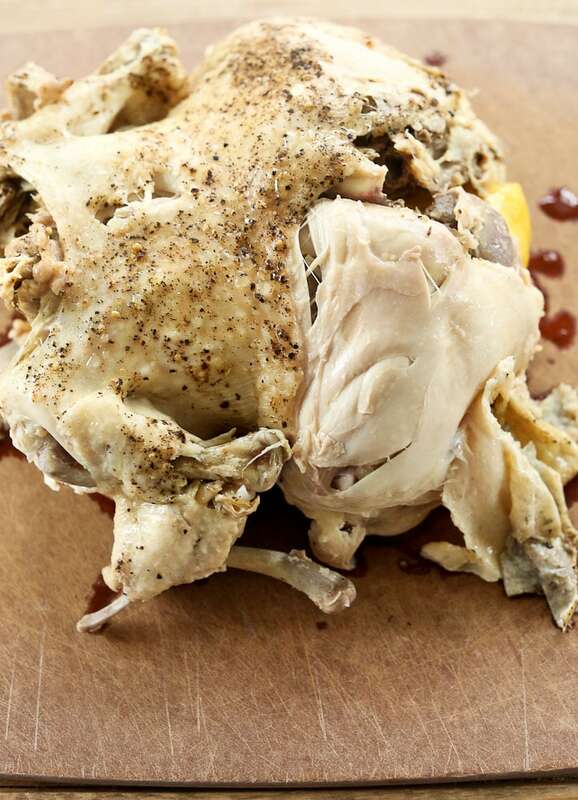 Learn how to cook a whole chicken in the Instant Pot in less than an hour! Perfect for meal prepping! *I use a 6 quart Instant Pot. I buy organic chicken and they are typically smaller than conventional chickens, mine average 2.5-4 pounds. If you make this Instant Pot Whole Chicken recipe, or any Happy Healthy Mama recipe, I would LOVE to see it! Please take a pic and share it on Instagram or the Happy Healthy Mama Facebook page and tag me @happyhealthymama ? Also, if you try it, would you mind rating the recipe with stars when you leave a comment? It’s VERY helpful for me and other readers if the recipes have ratings and reviews. I appreciate you! I love making a whole chicken like this but I don’t have an instant pot yet so I do it on the stove top. I need to buy an instant pot! This is such a time saver. You really need one girl! i have tried doing a whole chicken and it worked…i wish skin stayed little crispy though. I am ashamed to admit I still don’t have an instant pot. I keep reading recipes that use them and I am becoming more and more convinced that I NEED one in my life! I could use cooked chicken like this is so many ways! Oh, and love the shredding in the mixer tip. I’m totally going to try that! Wow does that look tender! I’ve been dying to try a whole chicken in my instant pot. This is a great step by step! I haven’t purchased an instant pot yet but posts like this make me question whether I should just splurge and buy one! Your chicken turned out great! I totally need to try this!! I’ve also been meaning to try shredding chicken in my mixer and need to get on it! This looks incredibly tasty! I really want an instant pot! This is a great idea and what an awesome time saver for meal prep! I’m going to do it! I’m still considering to buy an instant pot, but this post could definitely convince me. It looks so easy and delicious. Perfect to combine with a family of 5! life gets easy and peaceful with IP right!lovely post. Looks like a perfect weeknight meal!